▪ EM-FS708 Anti-static Cleanroom Swab is constructed from compressed, 100 ppi (Z) Closed-cell polyurethane foam that is free from organic contaminants such as silicone, amides or phthalate esters. The foam is thermally bonded to the handle, thus, eliminating the use of contaminating adhesive or coatings. Laundered and packed under an ISO Class 4 Cleanroom, the foam exhibits low particulate and ionic content. It has excellent compatibility with most common solvents including acetone as well as excellent absorbency and solvent-holding capacity. ▪ The Large Rectangular Head Swab is a large, general-purpose swab for cleaning surfaces . Its closed-cell polyurethane foam head possesses excellent durability and cushioning. A rigid internal paddle provides firm support. The large polypropylene handle enables good control and ease of use. ▪ The swab handle is ESD-safe and is made from polypropylene. The handle is compact and will not contribute to particulate or organic contamination. Designed for general purpose cleaning, EM-FS708 Anti-static Cleanroom Swabs are the ideal swabs to use in cleaning static sensitive components or parts. 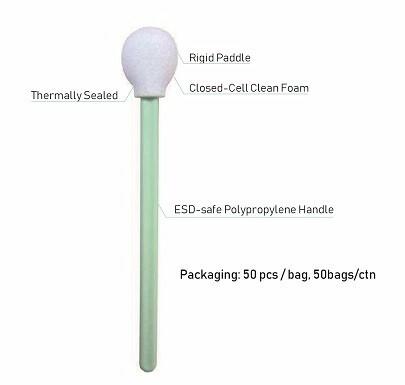 ▪ EM-FS708 Anti-static Cleanroom Swab is constructed from compressed, 100 ppi (Z) Closed-cell polyurethane foam that is free from organic contaminants such as silicone, amides or phthalate esters. The foam is thermally bonded to the handle, thus, eliminating the use of contaminating adhesive or coatings. Laundered and packed under an ISO Class 4 Cleanroom, the foam exhibits low particulate and ionic content. It has excellent compatibility with most common solvents including acetone as well as excellent absorbency and solvent-holding capacity. ▪ The Large Rectangular Head Swab is a large, general-purpose swab for cleaning surfaces . Its closed-cell polyurethane foam head possesses excellent durability and cushioning. A rigid internal paddle provides firm support. The large polypropylene handle enables good control and ease of use. ▪ The swab handle is ESD-safe and is made from polypropylene. The handle is compact and will not contribute to particulate or organic contamination. Designed for general purpose cleaning, EM-FS708 Anti-static Cleanroom Swabs are the ideal swabs to use in cleaning static sensitive components or parts.